The world's most widely-read travel magazine has announced a list of 21 destinations to visit next year. National Geographic Traveller's network of worldwide travel specialists picked the bulk of the places - with the 21st venue selected by readers of the publication. The magazine recommends that holidaymakers looking for a great place to visit next year should scan its list before booking their 2014 travel insurance. 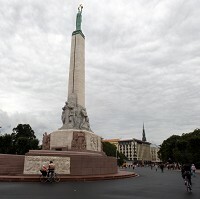 Among those on the list is Riga, the colourful capital of Latvia, which is 2014's European Capital of Culture and has recently been named Europe's prettiest city in a separate survey. Riga, known for its spectacular night views, was praised for its "pulsating big city vibe" and Europe's biggest collection of art nouveau buildings. The list also includes Winter Olympic host Sochi in Russia, the Rocky Mountain National Park in Colorado and India's Ranthambore National Park. Sochi sits on the Black Sea coast near the border with Georgia, and hopes to stage next year's Russian Grand Prix. Rocky Mountain National Park is situated in north-central US and affords wondrous mountain views. Ranthambore is one of India's biggest national parks, located in the north of the country. It is famous for its magnificent tigers and myriad colourful birdlife varieties and a great favourite among wildlife photographers. Keith Bellows, editor-in-chief of National Geographic Traveller, said its yearly Best of the World list does not reflect hotspots drawn from celebrity sightings or travel statistics. He said: "If you want to explore places worth visiting now, this is a great place to start." Last month, travel rival Lonely Planet announced its own Best in Travel 2014 list. Brazil, popular with eco-tourists and staging football's World Cup next summer, and Paris, an iconic cultural city much loved by romantics, took the top spots in the country and city sections respectively.